How to wash your 360 Wave Brush. 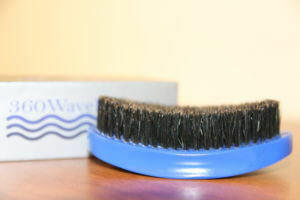 Caring for your 360 Wave Process wave brush is more simple than you think. The first thing you should know is that the brush is carved and made of natural, genuine wood. Most 3WP brushes are painted to get the color you see on the brush. These care instructions are created with those two facts. If your 3WP Brush needs to be cleaned, you can use your bathroom sink and faucet to clean it quick and easily. You don’t need any soap to clean your brush unless it is extremely dirty. The only materials you need are running water and a small tooth comb. First, you should start the water in your sink. You should then take your 3WP Wave Brush and place the boar bristles under the running water. We suggest that you do not place your entire brush under water for extended periods of time due to the fact that it is made of 100% real natural wood. Do not submerge your brush under water to clean it. Running water over the bristles is enough to clean out any dry hair products that may be making your wave brush dirty. We also recommend that you use a small tooth comb to comb out any hard to get debris that may be in your brush’s bristles. After getting all excess debris out of your brush by placing the bristles under the running water and combing it, you should then dry off all of the water from your brush as soon as possible as to prevent the water from being absorbed by the natural wood. Please refer to this video for further instructions on cleaning your 360 wave brush. For more helpful 360 wave videos, be sure to subscribe to the 360 wave process youtube channel. Also, make sure to follow @360Waveprocess on instagram for all the motivation you need!